Caramel Apple Oatmeal is the recipe for today. If you have been following this blog for awhile, you know I am a huge fan of oats. Overnight Oats, Oatmeal Cookies, Slow Cooker Oatmeal or Energy Bites made with oats. This slow cooker healthy oatmeal is not only easy, but it tastes awesome too. If anyone tries it in the Instant Pot, please let me know the results in the comments section of this post. This no fuss healthy oatmeal recipe is gluten free and vegan. Cinnamon apples and oats, with a delicious caramel sauce. You can use either almond milk or water for the oats. Make a weeks worth of breakfast with this healthy recipe. 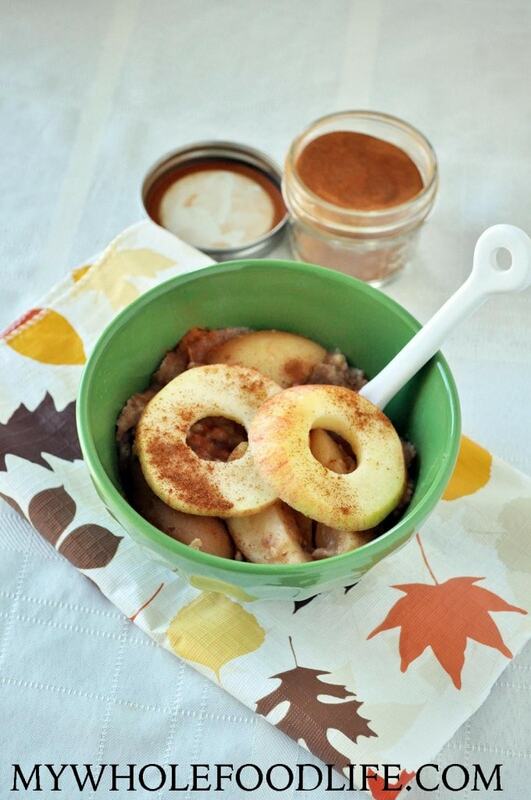 In a slow cooker , combine the oats, apples, water and spices. Cook on high for 2-3 hours. While the oats are cooking, make the caramel. In a blender , combine the soaked dates and maple syrup. Blend until smooth. Once the oats are cooked, drizzle the date and maple syrup "caramel" into the oats. Enjoy! This sounds like a winner! I'm going to try it in my instant pot so I can have it when I wake up! I have been wondering about the instant pot. Do you use it regularly in the kitchen to make it worth the buy? Yes!! I use it everyday for so many things. It is a huge time saver! Have you tried it with the dates and syrup put in the crock pot as well? Do you think they would 'disintegrate', so to speak, like they do with the cold overnight oats? I have come to the conclusion, that there is nothing better than steel blade cut oats!! If it weren't for you, Melissa, I would never have tried them. I suppose it was about 3 years ago, and I'm only guessing, when you came out with the recipe for *Overnight Oats*. I was so thrilled, because one of our stores had steel blade oats on a huge, huge clearance. I purchased 20 pounds!! I had always eaten OLD FASHION OATS. Steel blade oats hold up to pretty much anything, & I LOVE the chewy, al dente consistency. ALWAYS hated what's known as, INSTANT OATS. Gross!! I absolutely love the overnight oats. I discovered that I can basically prepare them anyway I want, but I use your base recipe as far as the recipe is concerned. I Find myself always using applesauce, cinnamon, and of course, some milk in the morning. I, too, enjoy eating them cold. These definitely keep a person feeling full at least until 1 or 2 p.m. NOW, ..... I LOOK FORWARD to trying this recipe. This looks absolutely wonderful, to say the least. :-) THANK YOU!! So once they're made, you put them in individual containers to put in the refrigerator overnight, correct? And for the person who said they were going to put them in their instant pot, would you be cooking them in the slow cooker? I have an instant pot, I'm a newbie to it, so I would love any pointers on using it for my oats in the morning :-). Thanks! Once they are made, you can store in individual containers, or all together. :) I think you can make the oats in the IP, but I haven't personally tried yet. Would regular oats work too? Yes, but you probably will cook them less. I love all oat recipes - but oatmeal recipes are definitely one of my favourites!!!! So thanks for another great one!